Whether you're going to a special events, or just casual hang out with your friends, you must be bring some makeup in your bag. For me, I always bring my essentials, just in case for touch up after long day activities. Actually, I've talked about this in my talk show few months ago, but I haven't discussed this in details. I never go without this essential, it really helps to keep my skin smooth and even all day long. I always choose the one with SPF to protect my skin from any damage outside. The first makeup I tried when I was a teenager, and will always become makeup essential in my bag. Right now, matte finish is my favorite. Unless you have eyelash extensions, mascara is a must have items in your bag. It add drama to your lashes and makes your eyes pop instantly. I used to wear Tony Moly Backstage gel eyeliner in black, but right now I love to wear Maybelline Lasting Drama Gel for the eye liner. I love contouring so much. As an asian girl, I always want more dimension on my face and contour kit is a must have item to sculpting the shape of my face. Of course if you're going to a party, not all of these will fit in your small clutch. For a party, I usually only bring a lipstick for the essential. 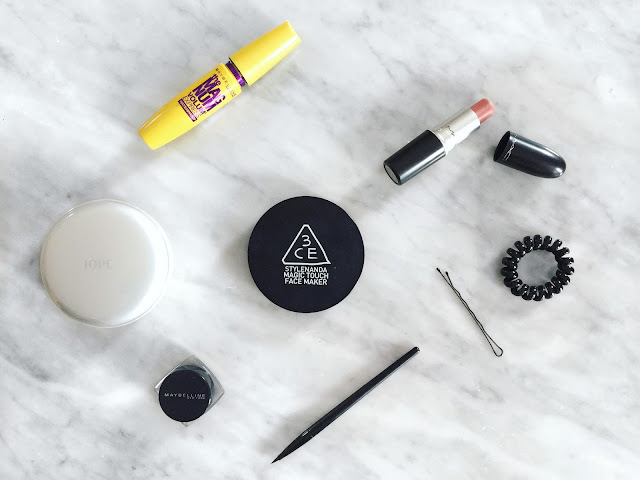 I believe each of us have different makeup essentials, let me know what's your must-have beauty products? Foundation and lipstick are musts for me too! Thanks for sharing your essentials! I love that lipstick. Great products, I love MAC lipsticks! Foundation, Eyeliner, Falsies, and Lipstick are a must for me! I love your must-haves babe! The Items you had mentioned on the article They ALL MY MUST HAVE TOO Hahah! Review 3CE donk Mbak. hehhe.. nice post.. I wish I knew how to contour! It's definitely on my list on things to learn beauty-wise! these are pretty much my makeup must haves. I literally can;t live witouth foundation, lipstick and mascara! I have like four lipsticks in my purse! That's a must for me but all are essentials! I totally uderstand, why These are your favourites. Love the lipstick. amazing one. mascara is a must in my book! Thank you, yu! Your comment always made my day! I have the same items minus mascara and contour kit.